Another "To Do" item on my list, after the long period of silence on this blog due to holiday, was to write something about the opening of the new Port Ellen Pier. As many of you know the current situation with the ferries is that they all sail to Port Askaig and skip Port Ellen due to extensive works on the Port Ellen pier in order to be able to accommodate the MV Finlaggan. The Port Ellen pier was closed for Ferry Traffic on the 25th of March 2011 and the Â£5M reconstruction works to replace the existing pier were planned to be completed around Christmas that same year. Due to unforeseen circumstances such as bad weather the reopening of the pier was delayed several times. On the 25th of May 2012 Caledonian Martitime Assests Ltd (CMAL) issued the following press release: "Harbour dredging works and backfilling with rock armour within the inner and outer harbours are now complete. Works to complete the new pier, which are being undertaken from land, are continuing to utilise divers where necessary. A small workboat remains on site for further 3-weeks to facilitate fitting of fendering and ladders to the pier. At this time the main pier remains closed to all vessels for the duration of the works." 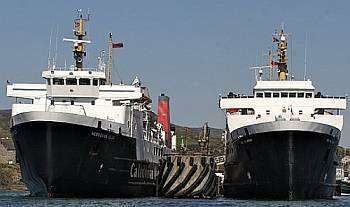 which was followed by another press release on the 13th of June which stated: "From Thursday 14 June 2012, CalMac Ferries Ltd will be conducting berthing trials at the port and by arrangement a cargo vessel will berth at the pier on Monday 18 June to deliver grain for the islandâ€™s whisky industry." From what I've heard the berthing trials have completed successfully and I understand that Port Ellen Pier will now reopen for ferry traffic on Sunday the 1st of July. There seems to be some misunderstanding about the ferry ports though. I've been told that some people believe that from next week onwards the ferries will only visit Port Ellen and not Port Askaig. That is however not the case. The Islay Ferry timetables from the 1st of July to 20 October show that both Port Ellen AND Port Askaig will see the two Islay Ferries (Hebridean Isles and MV Finlaggan) in their respective ports. What happens with the ferry services to Port Askaig and Port Ellen in the future due to the Ferry Review will be decided on at a later date.